Elevating results is what we’re all about at Top Floor, and we love to celebrate when our clients successfully take their marketing program to a new level. Our latest cause for champagne popping is Berntsen International, a manufacturer who saw double digit increases in their results and drastically lower costs per lead by adding Bing advertising to their marketing program. But before we get too deep into the metrics, let’s talk about the backstory. 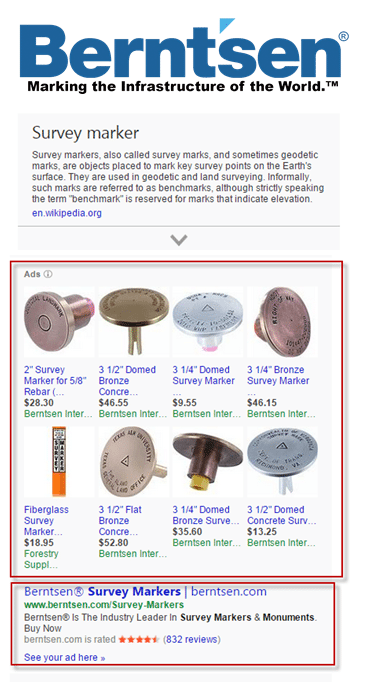 Berntsen International, Inc. is a major manufacturer and supplier of survey markers, survey monuments, utility markers, and related accessories. Like many of our clients, they’re challenged to differentiate and compete in an environment where more and more buyers start – and often complete – their purchasing journey online. Berntsen first started as a Top Floor client about a year ago, because they wanted to build awareness and drive more traffic to their site. And not just any traffic – the kind that would convert into leads and ultimately result in closed sales on their e-commerce website. Berntsen’s ad performance on the Google Network was steadily improving over time. But as we looked at the analytics on their customer base and who was engaging with their site, we were intrigued by the idea of adding Bing to their tactical mix. Since large portions of Berntsen’s clientele are government workers, they’re often blocked from changing these defaults – which made them a perfect target for a Bing campaign. One of the big takeaways from this is how critical it is to know who your audience is and where they’re spending their time! Most digital advertisers focus their efforts on Google, since that’s where the volume is. But because fewer advertisers invest dollars and energy in Bing, that can mean less competition for targeted keywords and phrases – so the associated costs per click are often significantly lower. When launching new initiatives with our clients, we often encourage them to take a mindset of experimentation. The goal is to come up with hypotheses on ways we could improve results, and then seek to validate or disprove those hypotheses as quickly as possible. So, after some deliberation, the Berntsen team decided to give it a shot and invest $600 in monthly spend for Bing advertising. 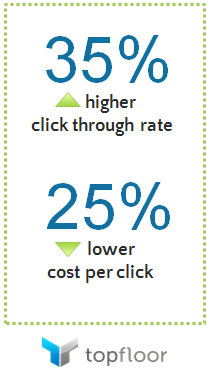 And they were glad they did — with the Bing ads, we saw a 35% higher click through rate and 25% lower cost per click. What we also found was that visitors and potential customers that use Bing are a completely different group than those using Google. We weren’t duplicating efforts by adding Bing advertising at all – on the contrary, we were expanding our reach and getting exposure to a much broader audience. We generated 69K additional impressions and 2K clicks during the Bing pilot that we may have missed out on otherwise. After our initial Bing pilot, Berntsen has decided to continue investing in this platform and is now exploring other tactics to build on their results even further. Berntsen’s team has a mindset of continuous improvement and is never complacent – so we hope to have more success stories and results to share soon! Over to you — have you tried Bing advertising? What have been your results? Any successes or words of caution to share with readers? Let us know in the comments!